The Sixty Best Episodes of XENA: WARRIOR PRINCESS (21-25) | THAT'S ENTERTAINMENT! ← Editorial: What Went Wrong on Wisteria Lane? With all that said, let us resume with episodes 21-25 on the list. For those who are unaware, this episode was the product of an accident that Lucy Lawless had on The Tonight Show in which she broke her pelvis. Scripts were tossed out and re-ordered, as production clamored to produce new Xena episodes with minimal Xena! One of the many tricks used included re-writing the ending of the previous episode so that Xena stayed dead. This allowed room for another episode where Gabrielle could attempt to bring her friend back. In this episode, Gabrielle runs into the Amazons and meets the bitchy Queen Velasca, who defeated the previous queen in “fair combat.” But now that Gabrielle’s back in the picture, Ephiny insists that Gabrielle use her right of caste to assume the throne. Naturally, this pisses off Velasca. Meanwhile, Xena inhabits the body of Autolycus, the King of Thieves (Bruce Campbell), and plots with him to recapture her body from the Amazons, who intend to burn it in a funeral pyre. He teams with Gabby to hunt the magic Ambrosia, which will bring Xena back to life. This was the highest rated Xena episode ever — probably the result of publicity from Lawless’s accident coupled with a provocative kiss that Xena and Gabrielle share while the former is inhabiting Autolycus’s body. “The Quest” is a great episode with strong dramatic beats, witty dialogue, growth for Gabrielle, and appearances by some great guests — Autolycus, Ephiny, and Velasca. Though we don’t see Xena in the flesh much, this is classic Xena from start to finish. This was the series’s first flashback episode and our first extended glimpse of Evil Xena on X:WP. In “Destiny,” Xena gets hit by a tree (it’s not as funny as it sounds) and hovers near death. As Gabrielle takes Xena’s body to a mystic healer, Xena’s brain flashes back to the time that she was a nomadic warrior and pirate, defending her homeland and destroying its enemies. She captures and ransoms a young Roman general who happens to be Julius Caesar. They have a wild night and make plans to one day conquer the world together. Meanwhile, Xena finds a Gaelic slave girl who has stowed away on the ship. The girl, M’Lila, becomes a trusted ally and teaches Xena how to use pressure points — one of the Warrior Princess’s signature moves. Xena and Julius meet up again, but this time he captures HER… I won’t spoil the rest for you except to say that it’s deliciously dark. The flashbacks, the series’s first real look into Xena’s past, are great and the best part of the episode. Also, the initial scene of Xena riding through the ruins of Cirra, Callisto’s hometown, is very powerful and an excellent lead in to the Caesar story. But the fight Xena has in the beginning doesn’t work as well; too many unanswered questions. (Who exactly is this tribe? Why does the little girl have the same medallion as M’Lila — are they just from the same region? Etc.) Some stronger connection to the flashbacks would have made a tighter episode. Still, this is an excellent and entertaining episode, recommended for first-timers interested in Xena’s past. Yes, this is the first episode! If you’ve read my ramblings about sitcoms, you know that I’m not crazy about many first episodes — too much exposition. But this is an excellent series premiere with a strong story and many of the show’s trademarks already in place. Though we’ve seen Xena before on Hercules, it’s obvious from the beginning of the episode that this is a very different woman. She starts the episode by silently renouncing violence and burying her weapons and armor. But when she sees a bunch of young girls being rounded up into slavery, Xena comes out of retirement to save them. One of the girls is Gabrielle, a young bard who desperately wants to travel with Xena, despite the Warrior Princess’s firm protests. The warlord who was capturing the girls is Draco, a former flame of Xena’s, who upon learning that Xena is heading home to her mother, decides to make things difficult for her. Draco is, as I’ve said before, a fascinating villain who challenges Xena in a real and seductive way. The scenes between Xena and her mother are perfectly played, and the final fight is one of the first season’s best. The only thing that doesn’t work for me here is the blind cyclops, which feels far too silly for Xena. (Better suited to the much lighter Hercules.) Meanwhile, the ladies aren’t totally comfortable in their roles yet, but that will come soon. Otherwise this a very satisfying episode that introduces the characters in a great way, and represents the series surprisingly well. This episode does much in establishing who the characters of Xena and Gabrielle both are. 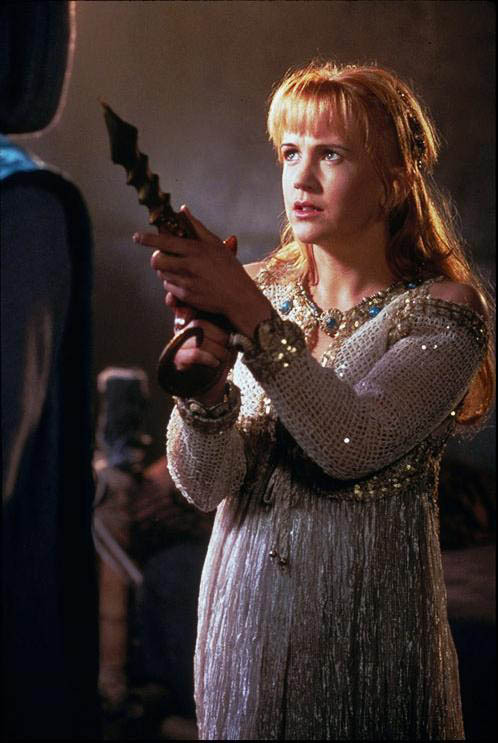 “Dreamworker” is largely about Gabrielle’s initial eagerness to fight alongside Xena, only to realize, after she is captured and expected to shed blood in a series of perverse tests, that violence should be a LAST resort. That seemingly ordinary principle sets up the second most important conflict of the entire series: Gabrielle’s struggle with the necessity of violence. The other notable part of the episode concerns Xena’s confrontation with the nightmares of her evil past. While the resolution offered here — Xena confronting the memory of her evil counterpart and recognizing its importance in shaping the person she has become — is a simplified and condensed representation of her ongoing struggle throughout the series, this plot point further develops the primary conflict of the series: Xena’s search for atonement. As we see here, it’s not just about Xena’s quest for redemption in the eyes of others; it’s Xena’s quest for redemption within herself. The two characters, though they spend a lot of the episode apart, are seemingly brought closer together in the things that they both have learned while in the “dreamscape.” This is the first episode written by veteran Xena writer, Steven L. Sears, and both the story and dialogue are top-notch. Special notice should be given the final scene, which sums up the episode and the series perfectly. This is the best single-digit episode of the series. Recommended for new fans. This is an episode that even I sometimes struggle with. It’s arguably the most important episode from the first part of Season Five. But it’s flawed. Ares is pissed because it’s prophesied that the cult of Eli will bring about the end of the Olympian Gods. Meanwhile, Gabrielle is becoming more violent, as she feels the need to protect Xena and her child. When Xena goes off to fight some bad guys, Gabrielle is left in charge of protecting Eli. Gabrielle and Eli have an important, but brief, discussion about her return to fighting after giving up the “Way of Love” at the end of last season. So when Ares appears, Gabrielle follows Eli’s request for no violence, and watches as he kills Eli. Xena returns and she and Gabrielle argue. An angry Gab retorts: “So Ares is right? The whole future is shaped by warriors?” She storms off and begins secretly training with Ares. This story point, which was longer in the original cut, was condensed for time (and to the INCREDIBLE detriment of the episode). In the final edit, she renounces Ares again and makes up with Xena within ten minutes of the fight. This half-assed development seems to be a continuation of “Succession,” and I wish this beat got proper coverage. Though perhaps the most notable thing about this episode is Angel Callisto’s return to help Xena deal with her anger over Eli’s death. SPOILER ALERT: Callisto also confesses to giving Xena her baby while they were in Heaven. Yes, Callisto is the father! And then she becomes the spirit of her unborn child. It’s a strange, but beautiful moment. (This is the kind of story you’d find only on Xena.) This important, flawed, but ultimately powerful episode is too serialized to be good for first time viewers, but it’s necessary watching for devoted fans. Come back next Thursday for numbers 19-20! That’s right — as we near the end of our countdown, we’re cutting down to only two episodes per post! But don’t forget to check back tomorrow for another Film Friday post with two new Joan Crawford films! Pingback: THE XENA SCROLLS: An Opinionated Episode Guide (101 & 102) | THAT'S ENTERTAINMENT! Pingback: THE XENA SCROLLS: An Opinionated Episode Guide (103 & 104) | THAT'S ENTERTAINMENT! Pingback: THE XENA SCROLLS: An Opinionated Episode Guide (211 & 212) | THAT'S ENTERTAINMENT!